Born and raised in Frisco, Texas to a Colombian father and American mother, Sean knew early on that he wanted to cook professionally. Growing up in a multicultural family inspired him to learn more by the great cooks in his family. After graduating from high school, Sean earned a scholarship to play football at Texas State University. He attended Texas State University and then went on to keep his childhood dream alive by graduating from Le Cordon Bleu Culinary School in Austin, Texas. As a collegiate player the discipline, work ethic and leadership skills that were instilled in him made for an easy transition to a career in the kitchen. Sean Frye has been working as a professional chef for ten years. He worked for Kent Rathbun, an Iron Chef America winner and James Beard Award Nominee. Within the last seven years Sean has been in various positions throughout the company. Sean began working for Kent Rathbun Concepts in 2005 quickly advancing in his career. After working at Jasper’s Restaurant for a year, he was promoted to sous chef. Soon after, he was promoted to Head Catering Chef at Abacus Restaurant. Sean was responsible for creating all new catering menus, banquet menus, and procedures. 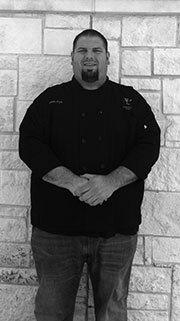 After two years doing catering, he was promoted again to executive chef at Zea Woodfire Grill in Plano. While there, he completely revamped every menu and was responsible for a staff of 15 cooks. Not too long after Sean was asked to assume dual roles of executive chef and catering chef at Zea. While being the catering chef for Kent Rathbun Catering, Sean successfully led a team that catered many large high profile functions all over Dallas. Some of his highlights include catering the Dinner in the Wild for 1800 people at the Museum of Nature and Science for the last four years, The Cotes du Coeur, Taste of the NFL, March of Dimes, Hunt Hill Trinity River Bridge, the Orlando Food and Wine Festival, numerous movie screenings, and countless others. If you are looking for a private catering company in Dallas with a top notch chef, TK Culinary & Sean Frye are here for all of your events!